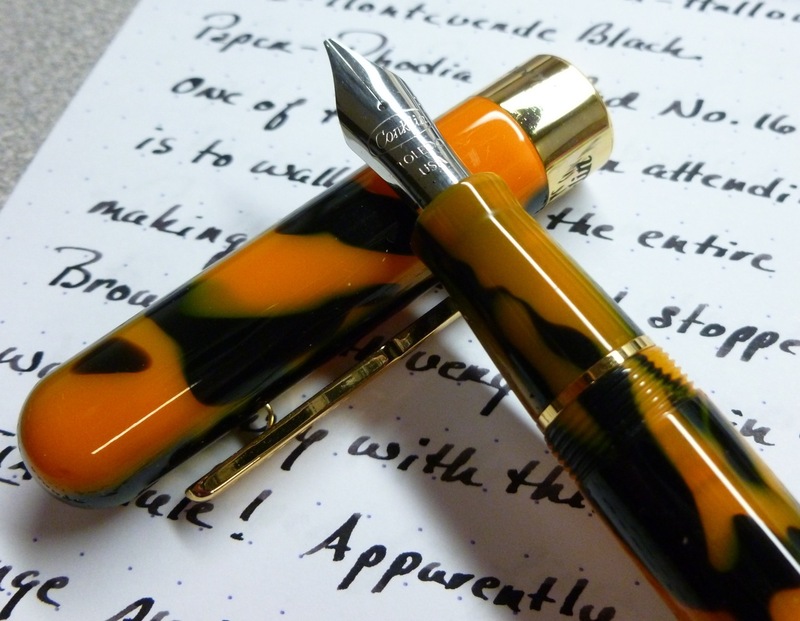 Before attending the DC Pen Show, I did a lot of reading about the best ways to navigate such a large show. One rule I heard over and over was to walk around the entire show before making a purchase. That made sense to me. By doing so you can eye ALL of the offerings and shop around for the best deal. So that was my plan. 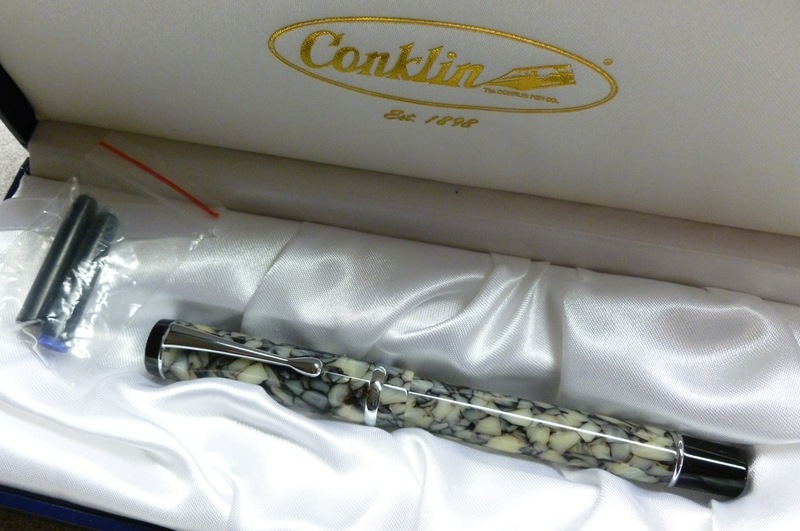 I stopped at Pendleton Brown’s booth VERY early in the show and walked away with this pen. No browsing. No comparing. I just swooped in and purchased. So there goes THAT rule! 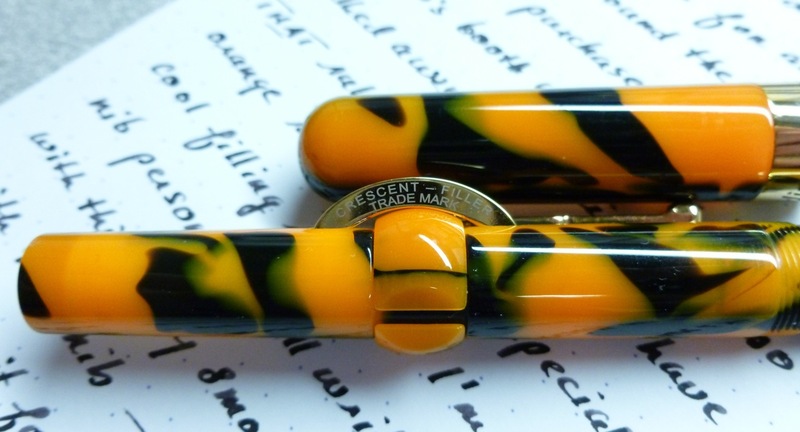 Apparently I have a thing for orange swirly pens (see “Tiger Stripey” and “Persimmon Swirl” as evidence)- especially ones with a cool filling system. 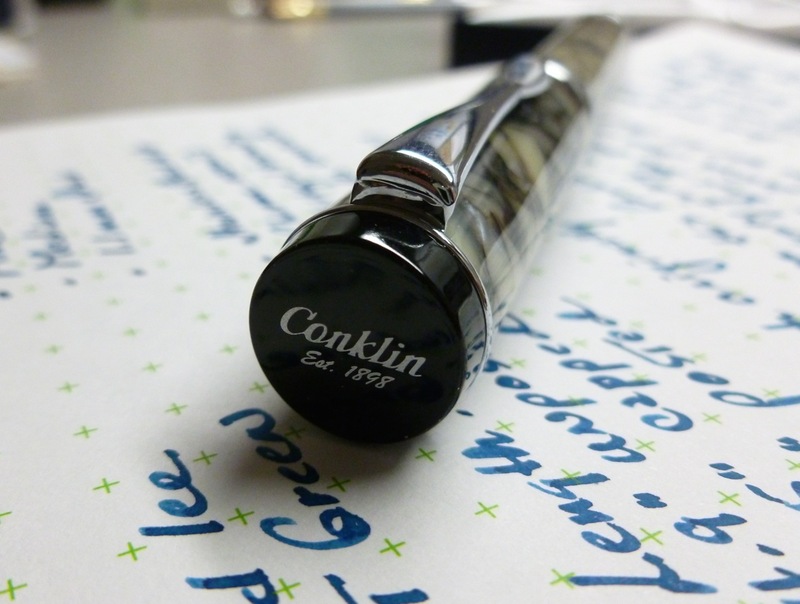 The Conklin Crescent Filler was a pen I wanted to try in person before buying because it looked as though the pen’s Crescent Filler mechanism could get in one’s way. I’m happy to report that this is not the case. The resin ring sits in the “web” between my thumb and forefinger and is not even remotely a nuisance. 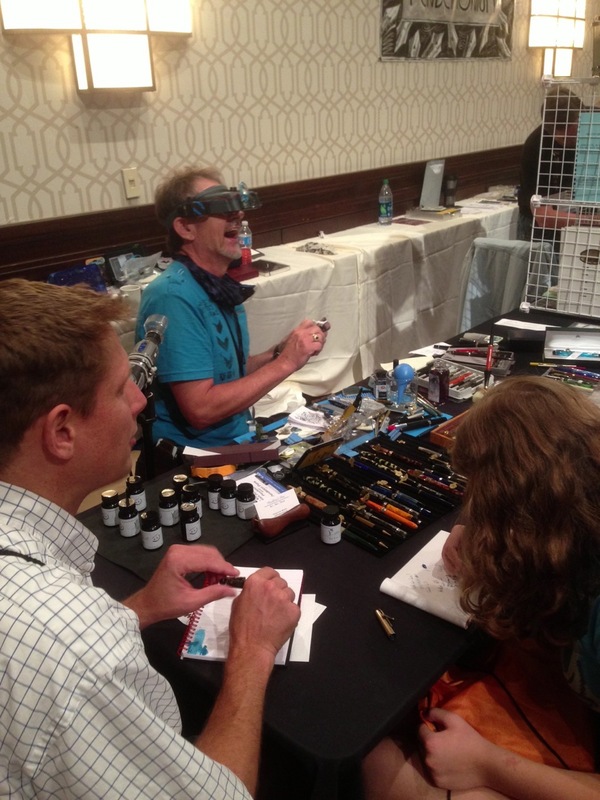 Even in the very early hours of the show, nibmeister Pendleton Brown was grinding nibs at a furious pace. People walked by his table, and literally tossed their pens at him, asking for “smoothing” or a re-grind, then wandered off. How he kept track of what he was doing is beyond me. But despite all of the nib work in front of him, he graciously took the time to explain how to fill this Crescent Filler. 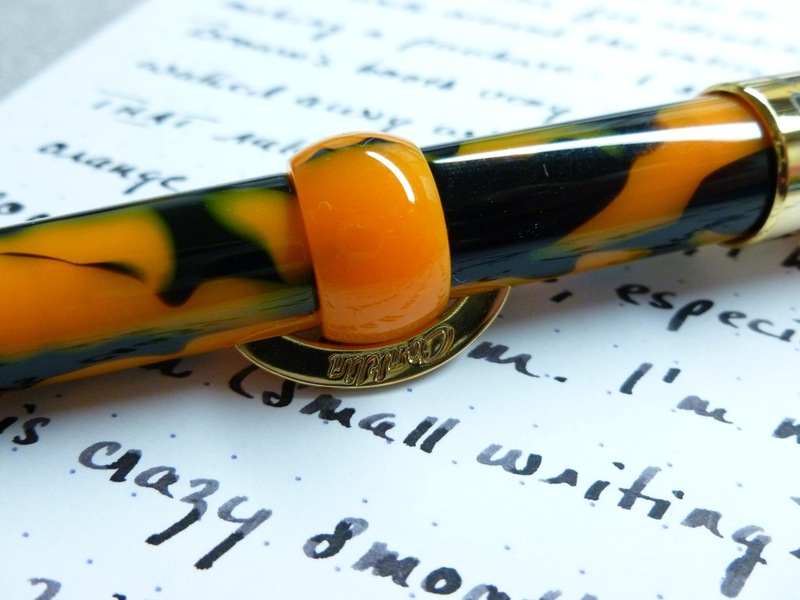 It’s all very simple- just twist the resin ring until it loosens, align the slit in the resin ring with the crescent, insert the nib into the ink bottle, and depress the crescent. 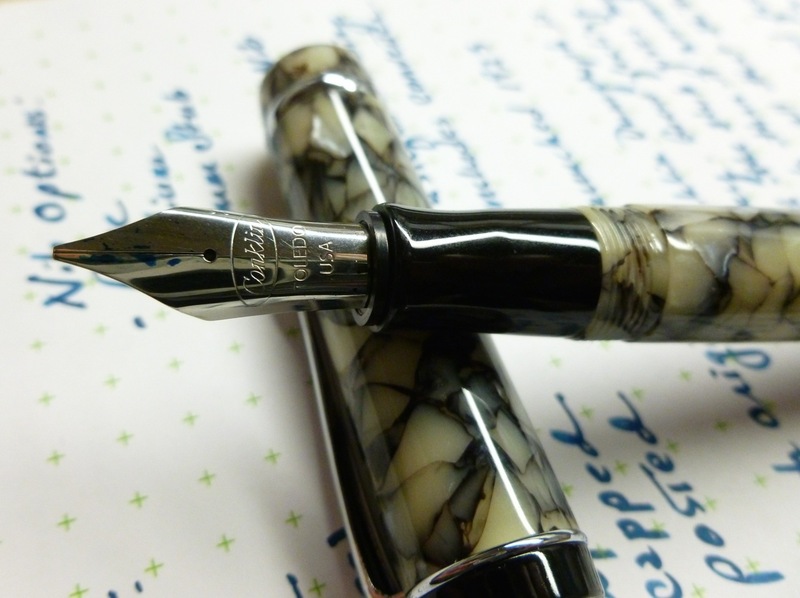 This compresses the “bladder” inside the pen so when the crescent is released, ink is drawn into the pen. After a few compressions, the pen is filled. No cartridge, no converter. Just fill and go. 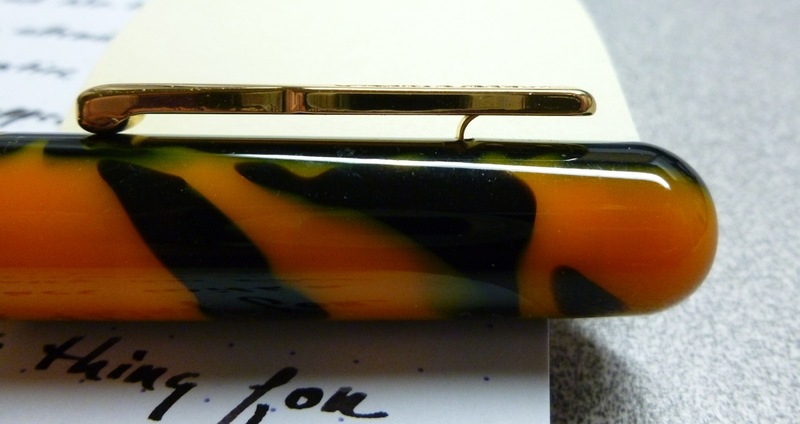 This style of Conklin pen is reportedly an exact replica of the original Crescent Filler used by Mark Twain…thus his signature on the cap band. 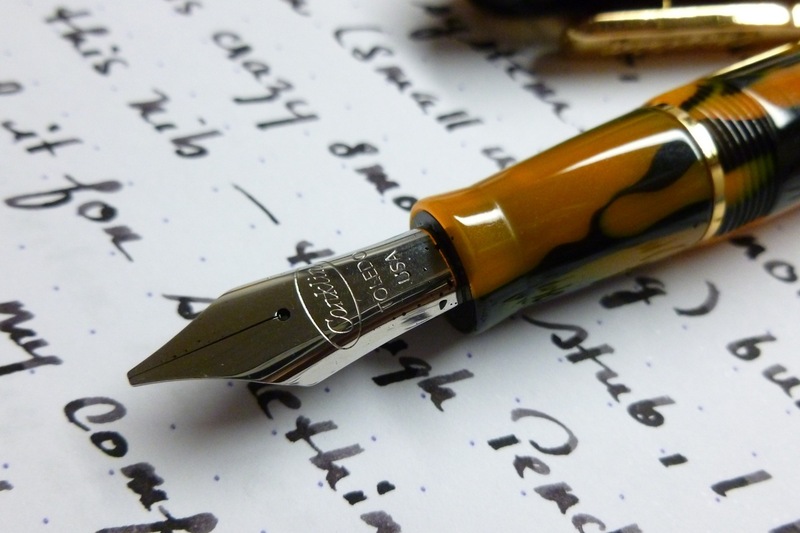 Twain was a fan because “…it carries its own filler in its stomach,” and also because the crescent kept the uncapped pen from rolling off of his desk. The spring-loaded clip is sturdy and quite springy. Pressing down on the end of the clip easily rocks the clip so that it can be clipped to a pocket or bag. The cap screws on and can be easily posted but I find that I usually don’t. (In fact, I hadn’t even tried to post it until I sat down to write this review.) 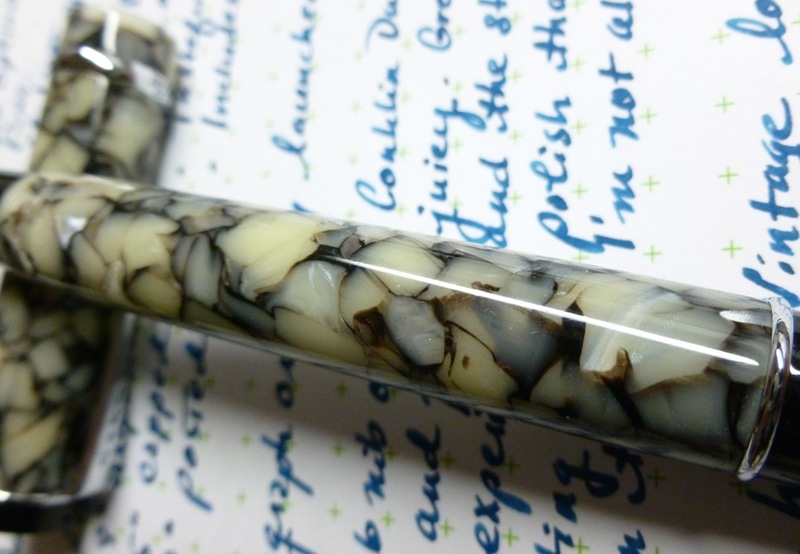 The resin pen feels equally well-balanced posted or unposted. One drawback of this filling system is that there really isn’t any way to monitor the ink level. So I just use it until it runs dry. No biggie. The stub nib means that this isn’t an everyday writer for me (though I DO doodle with it almost every day), but who cares? 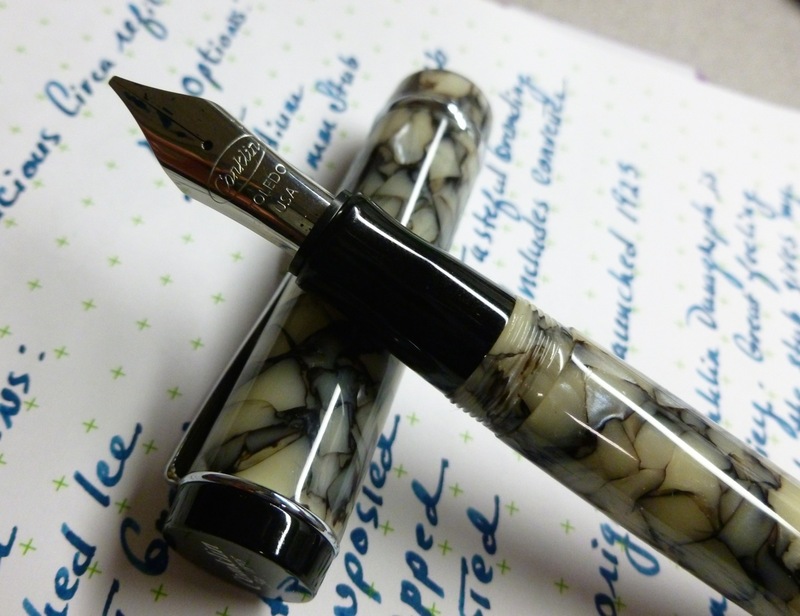 It’s so gorgeously smooth that there was no I was going to pass up this stub. So even though I stepped a bit outside of my comfort zone when I chose this pen, it feels so good. 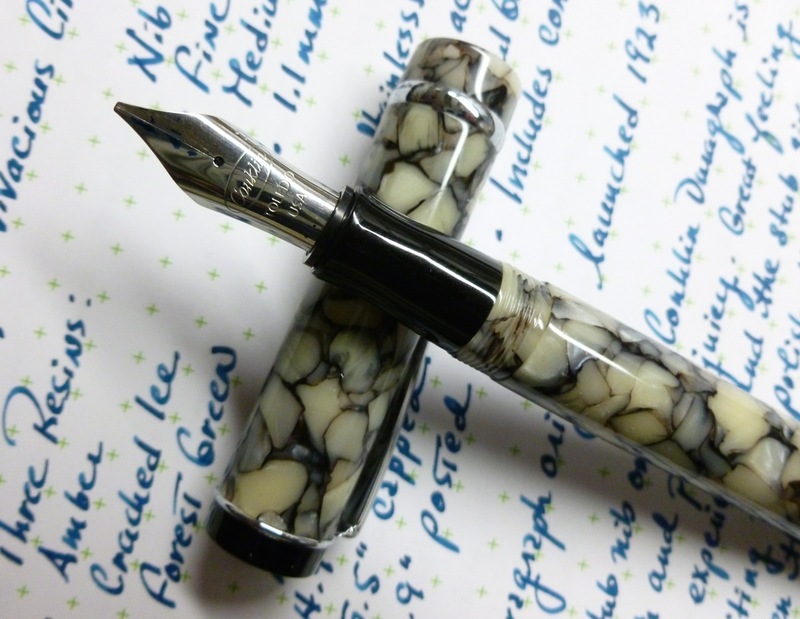 I thought that I might find focus at the DC Pen Show, but instead I found myself wanting to branch out a little bit. And you know what? Branching out is fun. And oh so smooooooth.